BAHRAIN were handed a narrow 80-83 loss to the UAE last night in the 23rd Arab Men's Basketball Championship in Cairo. The game was the Bahrainis' final assignment in the tournament's elimination round, and the result had no bearing on their qualification for the semi-finals. The nationals had already booked their berth to the last four, where they will face Algeria. Bahrain finished the eliminations with a 2-2 win-loss mark. 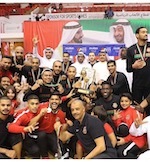 The Emiratis claimed their first win of the competition in four tries. The victory, however, was not enough to earn them a place in the semi-finals. The last two slots go to unbeaten hosts Egypt and Saudi Arabia, who had defeated the Emiratis in their head-to-head encounter during the eliminations. The semi-finals are scheduled to take place tomorrow, while the bronze and gold medal games are set for Friday. Bahrain were the early aggressors in yesterday's contest and they took a 25-17 lead at the end of the first period. The Emiratis bounced back in the second, holding the Bahrainis to just 14 points and tie the proceedings at 39-apiece at the half-time break. In the third period, Bahrain went ahead and enjoyed a narrow 64-58 at the end of the quarter. But just as if the Bahrainis appeared to be pulling away with the victory, the UAE had something else planned and they gradually began to claw away at the deficit. The Emiratis managed to get back to within 75-76 with three minutes left, and then power forward Qais Al Shabebi put them in front by three with back-to-back baskets. 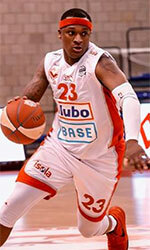 Young centre Mozamel Ameer had two free-throws and a fast-break lay-up to put Bahrain back ahead by one, 80-79. But Al Shabebi came up with a go-ahead basket and then pegged the final score from the free-throw to upset the Bahrainis and secure their first and only win of the championship. Bahrain's rising star guard Mustafa Hussain had three straight attempts from beyond the arc for Bahrain in the final minute, but he missed each time.